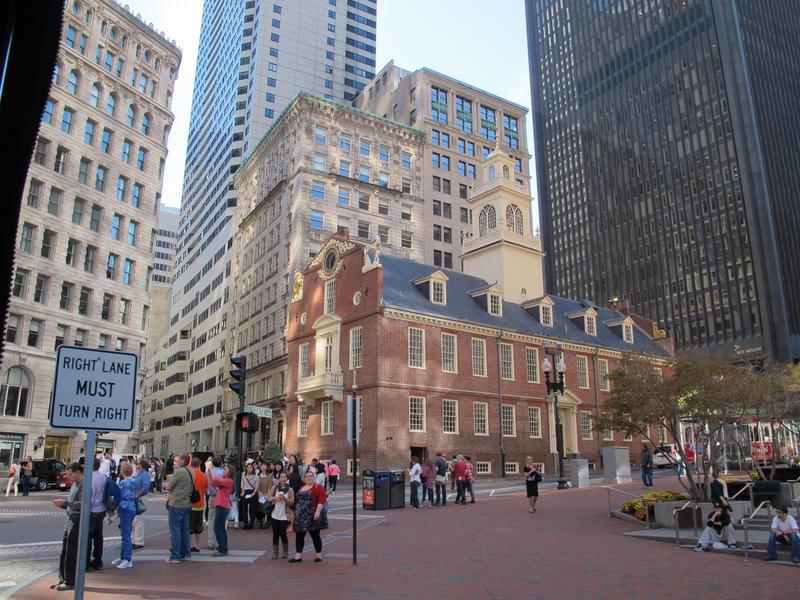 October 12th, 2015 – Boston, MA – From my Aunt’s home of New London, I took the train into Boston for a day of sightseeing. Tea party and revolutionary history was the order of the day. 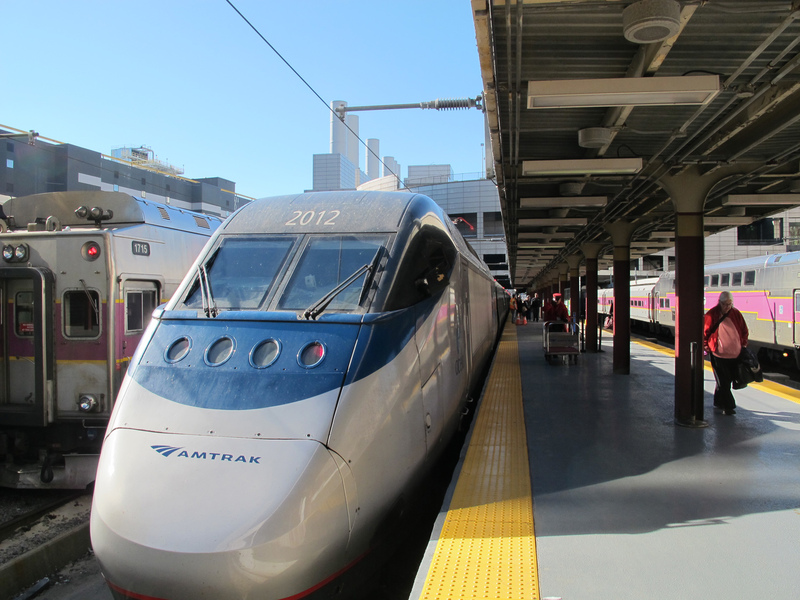 I took the Acela train to Boston early on a bright sunny day. While I waited for the train I got to watch the New London waterfront come awake to the bright morning. The better suspension and business class accommodations made the trip nice, but the car I was on had the seats facing backward and this wasn’t as nice for sightseeing. The train and train stations both had free WiFi, which made it possible to work on blog posts. The smooth riding train also made typing easier, as I learned by contrast with my ride back in the evening where the car’s movements made typing on a glass keyboard a little more problematic. The return trip was on a regional commuter train, I bought a business class upgrade which gave a more spacious seat and two standard power outlets, but not the smooth ride of the Acela. But after a day of using my electronics I was able to charge things back up on the ride to New London. So, up and back blog posting it was. Not far from the Boston South Station is the Boston Tea Party Ships and Museum. I rather stumbled upon this but it ended up being the best part of the entire trip. I bought the museum tour in combo with the hop on hop off trolley tour. The museum tour is led by actors in period costume and character. It was a very interactive and enjoyable way to learn the history, as they would take turns telling us background and then proceeding with a reenactment of the tea party. We were given a feather to represent our disguises as we participated in this rebellious action. We were each given a card with the identity of someone from the historical event, and a few of these had a small part to play. It was quite seamless as we listened to a speech by Samuel Adams, and boarded the Beaver and were instructed to only throw tea overboard. The tea would have been in small crates pack loosely, and the crate covered in a canvas wrap. 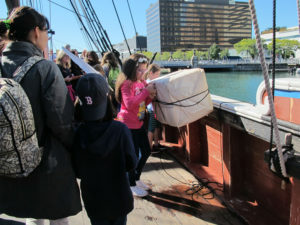 They would have used hatchets to open and dump the tea, but we just threw the crates overboard. Our crates were tethered, so they could be retrieved and be used for another photo op immediately after. From here we moved to the wharf for a bit more history and then inside for four very interesting presentations. First was a holographic performance of a couple of ladies, the second the display of one of only two known tea chests. Third was an interesting recreation of an exchange between Sam Adams and the King of England, based on letters, depicted as two paintings whose subjects come to life in the frame. Lastly was a well done wide screen film. I walked over and waited for the trolley, but the first one to come was full. They are supposed to come every 30 minutes and I was starting to get concerned that I might never use the tour if they were always full. But alas the next was quite empty, and we all were able to get on. I rode around the loop once, which took a good two hours. The tour guide seemed to have memorized a pretty dry script with some safe and punny jokes. As we got about halfway around the traffic got pretty snarled up, some of which had been anticipated by the company with a revised route. But some other street closure was news, and unexpected and caused us to wander around in a loop for a while. When traffic started getting really bad the driver switched into a pretty aggressive mode which made riding in the low backed seats pretty uncomfortable. After riding a few more stops I hoped off at Faneuil Hall and started walking the freedom trail. 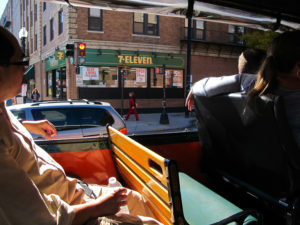 But having seen most of it from the trolley, I just headed for Boston Commons. I was pretty hungry at this point, and decided to grab some food. Great pizza by the slice at Sal’s Pizza, and a nice chat with the folks there. From here I walked towards Chinatown and back to the station. But not before heading off the wrong direction a bit by mistake. In the end I arrived that the station about an hour earlier than needed but stayed there because I was tired of walking. I found a concession that had (knew what it was!) plain soda water, and grabbed a bagel dog to go with it. Northbound platform at New London, heading for Boston for the day. Cross Sound Ferry heading out early morning. From the “city pier” in front of the New London Rail Station. Looking up Water and State streets into New London from the Rail Station. The Acela train pulled into Boston platform. 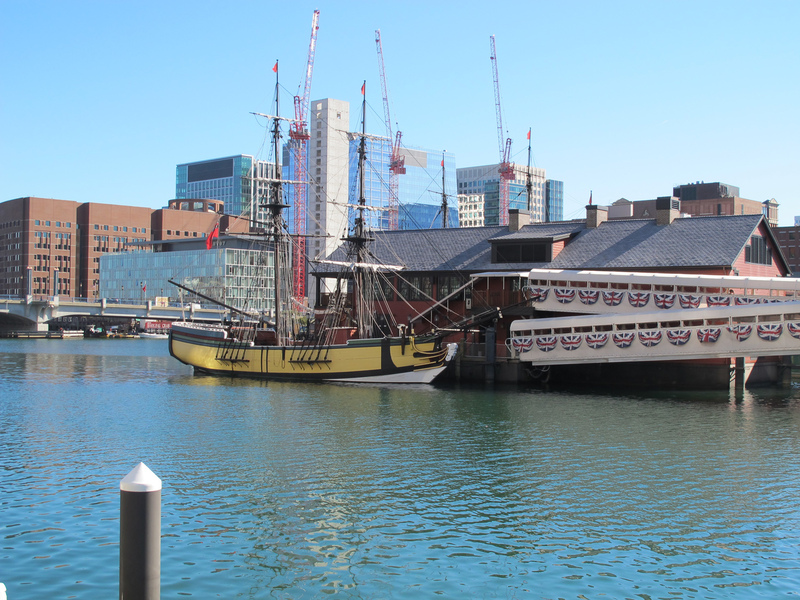 Boston Tea Party Ships and Museum from nearby. This is the ship I boarded during my tour. Souvenir feather from the tour. Actor portraying Samuel Adams, the museum’s immersive approach to history was quite effective and fun. 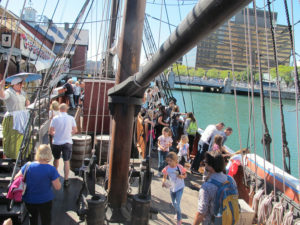 Aboard the Beaver, one of two ships at the museum. The red building with greenish windows is where the original pier would have been. Tossing the tea overboard. Now remember, just tea, the captains are our friends and they would be bankrupt if we tossed other things over. “Tea” floating in the bay, ready to be hauled back aboard and tossed over yet again. Mid point in the tour before we head back indoors. The Eleanor, their other ship. From the Trolley bus, a 7-Eleven. It is calling… I found another and got a slurpee indeed. Faneuil Hall, start of the freedom trail walk. Several times the trolley was redirected by unnanounced street closings. So we wandered a bit.